Welcome to Dionysos Rooms. Please use the menu on the left-hand side to browse through our website. We are going to make this website available also in other languages than English; so far, however, most of the pages are in English only. If you are seeking vacation amongst the Greek Gods with peace, hospitality, pristine beaches, Greek history and stories, and sunshine in the soul and heart, come to DIONYSOS ROOMS. We will intoxicate you with our fantastic stories and wine. Forget your problems. Fall in love with DIONYSOS ROOMS, the soul enriching views and friendly relaxed atmosphere. 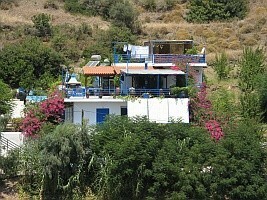 Dionysos Rooms is a perfect base for visiting the island. Sit on the terrace, sip ouzo and watch the mountains change colours. Here dreams meet the Dream. Here the Dream meets Love. Here the Myth becomes one with reality. Here you will find the Greece that you heard and read about and you'll live your Myth in Greece. If you are seeking this, come. To contact us and/or book a room, please visit our contact page. Please feel free to write your comments in our online Guestbook.